Back in the day Irish Linnet was one of the best fillies to ever don a bridle. She was part of an unforgettable twosome, her half-sister rish Actress was also a prodigious winner. They were owned by one of Ireland's greatest emigrants, Austin Delaney who loved to see his Mayo colors flashing by the winning line, especially at Saratoga. The after race parties at the local Parting Glass tavern were always something to behold. Now she seems to have a worthy successor. 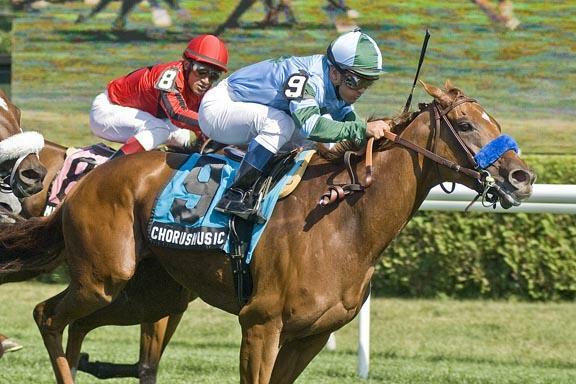 Chorus Music, also with strong Irish connections, won the Irish Linnet stakes at Saratoga at the weekend in fine style. Chorus Music is owned by the Curragh racing stables,run by Mike Devlin as proud an Irishman as you will find, as is his father, Bob Devlin, former Chairman of the American Irish Historical Society in New York. Chorus Music seems set to win again at Saratoga before the summer is out. She is doing her Irish predecessor justice and in the process keeping a great Irish story line alive.